Drawing heavily on Scripture and powerfully written in an easy flowing style, Imaginations: More Than You Think shows the reader that when we give ourselves over to the thought patterns of the world, we turn our backs on the Lord and His glory. Imaginations: More Than You Think was written so that the reader might understand how rich life can be when we focus our thoughts on God. You will come to treasure its wisdom as you learn to appreciate its three foundational principles: ?h We are what we think?V?Xso our thoughts determine our actions ?h Our present thoughts affect how we will spend eternity ?h Our greatest joy comes form surrendering our thoughts to God. Dr. James P. Gills teaches the reader how to wake up with love, happiness, and enthusiasm for the new day. True surrender to the satisfaction of being with Jesus and accepting His provision for us, sets the readers free from all daily worry and concern. - Publisher Pioneering surgeon Dr. James Gills explores what the Bible says about human imagination-a powerful force that stirs up our emotions, sets us on a course of good or evil, affects our very future-and provides instruction on how to harness it for God's glory. 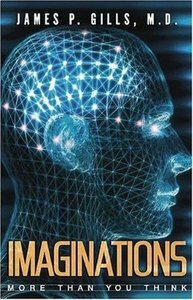 About "Imaginations: More Than You Think"
Pioneering surgeon Dr. James Gills explores what the Bible says about human imagination-a powerful force that stirs up our emotions, sets us on a course of good or evil, affects our very future-and provides instruction on how to harness it for God's glory. James P. Gills, MD, is the founder and director of St. Luke's Cataract and Laser Institute in Tarpon Springs, Florida. In addition to earning a reputation as the most experienced cataract surgeon in the world, he has dedicated his life to restoring more than physical vision. Dr. Gills has been an active author about spiritual topics for many years. His books include Love: Fulfilling the Ultimate Quest; A Biblical Economics Manifesto; Darwinism Under the Microscope; Come Unto Me: God's Call to Intimacy; and Rx for Worry.